Thread Doll with Tote - No Batteries Required! Make a HoneyBea Thread Doll set for your little Honey – No Batteries Required! When I was little, I loved the Betsy McCall paper doll in the back of McCall’s magazine, and I even cut out paper dolls from the pages of my Mother’s Sears Roebuck catalog. Designer/digitizer Deegee Hitzfelder combined her love for paper dolls with an adorable character named HoneyBea for a fun thread doll set. The ideal toy for toddlers and young children in church or the car, they’re a quiet “green” plaything that appeals to kids of all ages – even me. It’s a great surprise for the Easter basket and an unusual birthday gift. Plus, you can make the set in a day from simple, inexpensive materials. 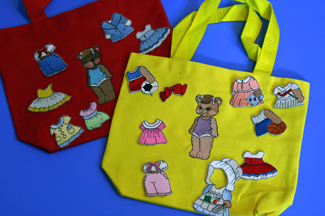 The totes in the images here are the perfect size for little ones and they are sold at Hobby Lobby in a four-pack for just $6.99. 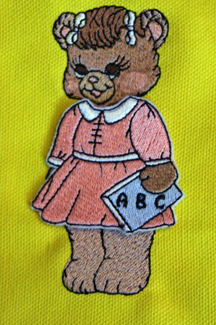 The doll clothes are stitches on inexpensive white felt and then hand-cut close to the stitching. 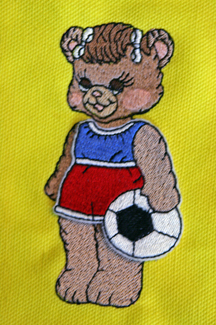 Stitch one doll on the front of a tote. This way, you will always have at least one thread doll. Feel free to go wild and change clothes and hair colors to make different versions of the thread doll to go inside the tote so she has “friends”. Hoop a piece of felt with a layer of cutaway. For best results, the cutaway should be hooped in the hoop along with the felt, not just laid under the hoop. 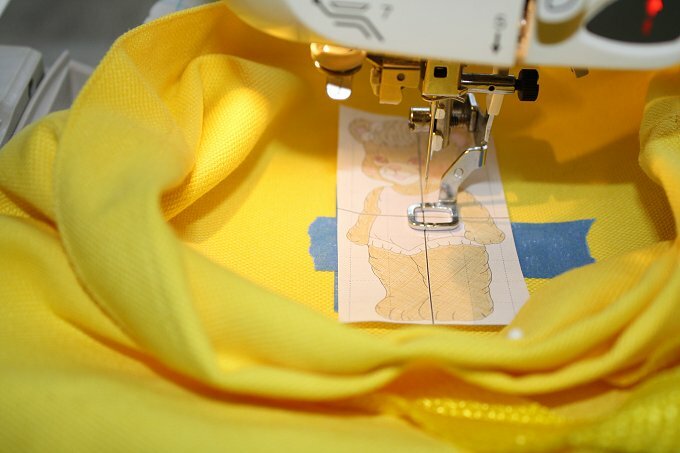 Stitch the dolls and clothes on the fabric, fitting as many pieces as possible in your hoop. Remove from the hoop and carefully along the edge of the felt just outside the stitching line. If you nick the thread, just mend with a drop of fabric sealant, such as Fray Check. You can use glue dots, Alene’s Tack it Over and Over or glue sticks to temporarily attach clothes to the doll. Stitch a bit of Velcro hook and loop fastener to the top of the tote to keep the content safely inside. Now, just give to your favorite child and watch the magic begin! You will be treated to watching your loved one play the old-fashioned way – no batteries required!